Earth is surrounded by a host of asteroids, some of which may temporarily become "minimoons." Earth has a habit of picking up, and later discarding, small companions called "minimoons," and these tiny objects could help scientists solve the mysteries of asteroids. That's the conclusion of a recent paper, which looked at these minimoons as potential science targets for research over the next couple of decades. Scientists have spotted only one minimoon to date, but they think there are many more that are simply too small for instruments to have identified — some just 3 to 6 feet (1 to 2 meters) in diameter. "Minimoons can provide interesting science and technology testbeds in near-Earth space," lead study author Robert Jedicke, an astronomer at the University of Hawaii, said in a statement released by the publisher of the new research. "The challenge lies in finding these small objects, despite their close proximity." But that could change soon, thanks to an instrument already being built. Called the Large Synoptic Survey Telescope (LSST), it's designed to excel at tracking temporary events in the sky. "The LSST is the dream instrument for discovering tiny, fast-moving asteroids, and we expect it will regularly discover temporarily captured objects within the next five years," Jedicke said. 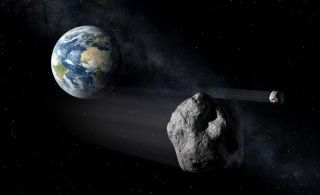 "We don't know whether small asteroids are monolithic blocks of rock, fragile sand piles, or something in between," co-author Mikael Granvik, a planetary scientist at the Luleå University of Technology, in Sweden, and the University of Helsinki, said in the statement. "Minimoons are perfect targets for bringing back significant chunks of asteroid material, shielded by a spacecraft, which could then be studied in detail back on Earth."